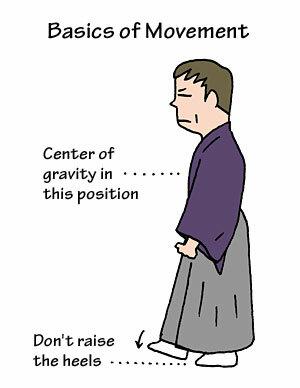 TRIVIA of Noh : Q52 : What are the basic forms and movements of Noh acting? | Home | Trivia | Q52 : What are the basic forms and movements of Noh acting? What are the basic forms and movements of Noh acting? Noh performances are composed of several basic actions called "kata" (forms) or "shosa" (movements). The audience may not recognise each of the continuous actions, such as slight movements of the arms and the legs, or shifts in the centre of gravity under the costume, but actors cannot truly perform Noh plays without completing these basic movements. Noh actors repeat momentary actions many times until the body learns them. Lessons are basically given step by step by teachers. When the actors achieve a certain measure of progress, they are often urged to reach a higher stage by themselves, repeating the actions without detailed instructions. Students sometimes try to master such arts by watching, or "stealing", the technique of their teachers or predecessors. The essence of Noh has been transmitted for more than 600 years through strict instruction and training. The basic form of locomotion is called "hakobi" (pace). Actors shift their weight to walk naturally with their feet sliding on the floor without changing the height of the centre of gravity. The action is forceful; it is sometimes said figuratively that an actor can withstand a typhoon. While not remarkable in comparison with dances or emotional actions, the beautiful movement of hakobi cannot be performed without basic skills cultivated by rigorous discipline. Actors sometimes practice by carrying a full glass, bowl or teacup on a tray, learning to move quietly without spilling any water. Crossing a long bridgeway with beautiful movements born of practice is a highlight of the actor’s performance.